If I’m spending £24,000 per annum then with wealth of £521,000 my withdrawal rate is actually 4.6% which is much higher than my withdrawal rate assumption of 2.5%. It’s also higher than the much hyped 4% Rule. Luckily though this doesn’t have to carry me until in perpetuity but instead needs to at least carry me until I can get access to the next pension bucket, which is at age 55, which is less than 9 years away based on the current rules. Rules that the government has form in changing. Not that many years ago age 55 was age 50 and even less years ago it was intimated that it would change to 57 in 2028 then stay 10 years below State Pension Age. As the rules have a habit of changing I’m assuming this bucket needs to as a minimum carry me until age 60. So the critical question is do I have enough to carry me to the pension bucket? So the worst case sequence sees my £521,000 turned into £127,000 during a period which included World War 1. Importantly, even through that bad time the portfolio would have carried me to my next bucket without reducing spending or needing to get a job. 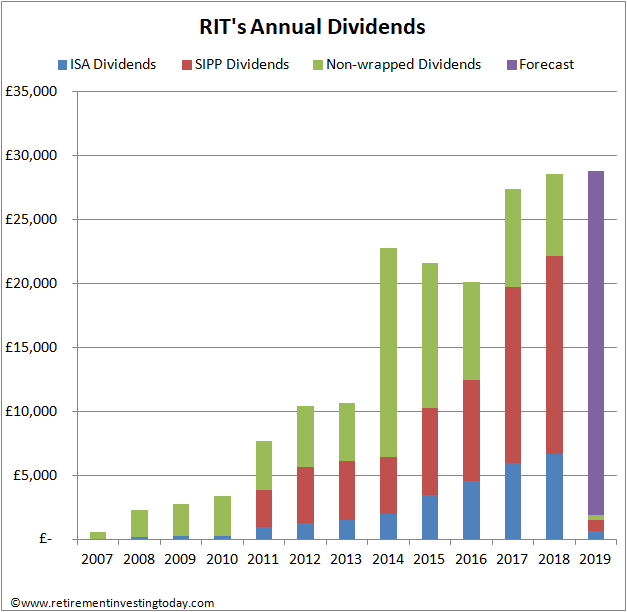 In 2018 the £521,000 also spun off £13,100 in dividends. A keen eye will notice that my annual spending of £24,000 is not being covered by these dividends let alone 85% of them. I put the living off of 85% of dividends rule in place largely for psychological reasons. I knew I would struggle to sell down my wealth on day 1 of retirement let alone during a bad bear market when wealth was down 40, 50 or even 60%. So when thinking about this rule I actually include the dividends being spun off within my pension wrappers as well. Including those 2018 dividends these were £28,597 which puts spending at 84% of dividends. In doing this what will happen in reality is that I’ll be selling down non-pension wealth to eat until I can access my pension bucket but at the same time I’ll be buying what I’ve sold down within the pension wrappers. So with time my non-pension dividends should fall while my pension dividends should rise by an equivalent amount. I can live with that. So far so good. I have enough wealth to buy a home, enough wealth to historically get me to private pension access and if I squint I’m spending less than 85% of my annual dividends. UK pension wrappers are tax favourable for a couple of key reasons. Firstly, the 25% tax free lump sum is attractive and secondly, they are a tax deferral strategy meaning you are taxed on the way out rather than the way in. The penalty for these benefits is a multitude of restrictions including access age and continual government meddling. My first event will be what is known as BCE1. It will occur when I first put my pension into drawdown which could be as early as age 55 but again I’ll assume the rules get changed and it will be more like 60. 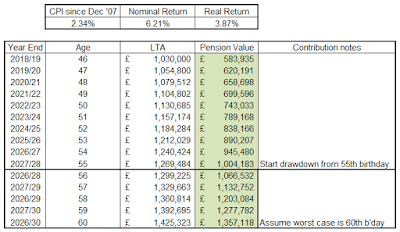 So will my pension lose its lustre? To calculate this I’ve assumed inflation of 2.3% and a nominal investment return of 6.2% which is my historic investment return to date. If I can get access to my pension at age 55 I’m well under the LTA which by then would be £1,269,484 with inflation increases and even at age 60 I have a small margin of error. So far so good. I have enough wealth to buy a home, enough wealth to historically get me to private pension access age and not too much pension that the tax efficiency is largely lost. Now the critical question becomes do I have enough wealth to ensure I run out of life before I run out of wealth. Worst case over a 40 year period that £1,099,000 has turned into a real £1,548,000 with a mean of £3,865,000 and a median of £3,038,936. Historically the future is bright which is great as I might live longer than 86, Mrs RIT might live longer than me after which a very healthy legacy is likely to appear. So far so good. I have enough wealth to buy a home, enough wealth to historically get me to private pension access age and enough wealth to ensure I historically run out of life before I run out of wealth. So what about that State Pension. Unlike the majority of the population I look at the State Pension differently. We’ve just seen that historically it’s likely I am going to end up with a lot of spare wealth. We also know that government debt is continually heading ever upwards and that the State Pension is not backed by anything except future tax revenues and/or further debt. I’m therefore assuming that at some time in the future the government will either continue to raise the State pension Age and/or means test it. I therefore assume I will receive a State Pension of exactly £0 and instead turn it into an insurance policy. I will continue to pay voluntary National Insurance contributions to ensure I build a full State Pension entitlement. That way if future sequence of returns are much worse than historic I can still eat. Mrs RIT is doing the same from a State Pension perspective. If it doesn’t get means tested and someday we can access our State Pensions then our wealth drawdown will reduce meaning we will likely end up with an even bigger wealth legacy. A problem I can accept. In conclusion during the accrual phase of my FIRE planning I built enough secure wealth for a home purchase early in retirement, enough wealth to bridge me historically to private pension age, enough wealth to historically grow slightly during my full retirement and an insurance policy against it all going horrible wrong. Now it’s time to drawdown. How are you planning for FIRE? Interested that you intend making NI contributions as a safety net. I, currently RE'd, also assume no state pension when my time comes, and in my previous working life have accrued a similar amount of SP to you. However, from 60, I intend to live off a DB pension. In my shoes, would you still make voluntary NI payments? Your DB pension certainly gives an additional layer of security. The way I'd think about it is to answer the question can I live adequately with what remains of the DB pension if the company providing the DB pension blows up. I don't have a DB pension so don't know how Pension Protection Funds etc work in this instance. After all if we do have a serious black swan event that decimates a relatively conservative drawdown portfolio then there is risk that the DB company is also in trouble. If you're under a railway arch under that scenario then maybe the State Pension is still a worthwhile endeavour. - DC pension and other investments in drawdown highest risk. - DB pension and Annuity lower risk. - State Pension lower risk again if genuinely poor while acknowledging starting age risk. Of course DYOR to all of the above. I've adopted the same approach with you, but with static assumptions (3 year bear market, then growth). Being 4 years older I have more confidence of the 55 access point, but have covered it being 60. I can't see means testing of pensions coming in without huge ructions, and not below the HRT limit. And by the time we are 67 we'll look a lot less rich than we do now. So I've been looking at NI top-ups before the prices rise in April. Its very complicated, and while the Pension Futures helpline will rattle off lots of numbers of their screens, they won't send you a printout to digest. Thank you for the hat tip RIT. I'm immensely grateful as always. I always find it interesting and helpful to read your planning thoughts. So thank you also for sharing. What I would say is that if NIC class 2 is available it is worth it (£150 a year). Class 2 was due to be abolished in April but last year the government u-turned. I understand the government are working on a pensions bill right now. But given we've had about half a dozen secretary of states in the past two years and of course Brexit, it's not clear we'll get anything ground breaking on pensions any time soon. Why continue to pay NI now? You can buy up to 10 years of previous years which were not qualifying. Wait until you get a little closer to claiming a state pension to see if it is worth buying more years. Unless you currently have less than 25 years? The reason people are paying for voluntary NICs (class 3) now are that the price was fixed until April 2019. This was to allow people to fill in gaps following the change to the single tier state pension and increased number of qualifying years. The jump can be pretty big, potentially doubling (class 3 was about £8pw ten years ago, going up to £15pw from April 2019). That said, some people paid class 3 thinking they needed to to get the full state pension. But they were already entitled to a better state pension under the S2P. So they basically wasted their money. The calculations are mind-numblingly complicated. NIC Class 3 is 14.65 now and 15.00 next tax year. From 2016 each year's payment accrues an extra 4.70 per week pension plus uplift. 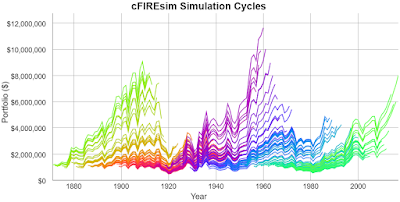 If the uplift is 2.5% per year the 4.70 becomes 6.0 over 10 years or 7.00 at 4% CPI. 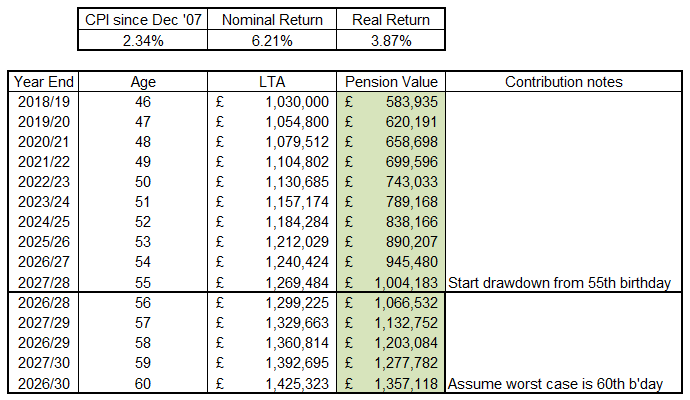 Say you were 10 years short of a full pension, to top up now would cost 14.65 x 52 x 10 = 7618 lump sum. You would need to live over 20 years to get your money back at 4% CPI. It seems poor value to me, when the age to receive it might go up and if you really needed it, you might qualify for a top up and/or other freebies being on a low income. I'd rather invest it myself rather than trust it to those people. What am I missing? 10 x £4.7 = £47pw = £2444pa how does £7618 / £2444 = 20? For me this feels like good value for guaranteed income. Wondering if to compare my withdrawal strategy with the State Pension if it's worth thinking about them both as an annuity whilst firstly acknowledging they're not for many reasons including risk. After all my drawdown strategy is saying I am willing to accept a 2.5% inflation linked yield on an initial pot of money. If I used the 4% rule then I'm willing to accept a 4% inflation linked yield. In comparison the new State Pension is £164.35 per week x 52 weeks / 35 years of contributions = £244.18 for a Class 3 NI contribution of £14.65 per week x 52 weeks = £761.80. I make that a yield of 32%. Now of course with my drawdown I can access that now meaning if I live to my average expected 89 years I've had 43 years of the annuity. In contrast assuming the State Pension stays at 67 I've only had 22 years of that annuity. Even this is still not the complete story because with my drawdown I'm not really treating it like an annuity. I'm assuming that even if worst case history plays out I'm leaving a legacy for others, including Mrs RIT, that is larger than what exists today. - Very bad bear markets like depressions, world wars, high inflationary periods, GFC's etc then that's a repeat of history and backtesting the sequence works with some margin. - One level above Mad Max. My portfolio is in big trouble. Who then is the most solvent. If government can't give subsistence to the genuinely poor in this scenario then we're at the next level. - Full Mad Max where it will be every wo/man for themselves and where the desired portfolio will be guns, ammo, tins of beans, bottled water and antibiotics. Plus a spade and bog rolls. One must be practical. One really mustn't simply add non-pension funds (ISA and GIA) to pension funds. The latter are pre-income-tax, so they're gross pounds, not nett. In the period where one has access to the personal pension (from 55), one really should draw the full personal income-tax amount from the (taxable) pension each tax year, in order not to waste that allowance. Once the personal income-tax allowance has been fully exploited, one can turn to draw on the non-pension funds for the rest of the tax year, preserving the taxable pension funds for use in future tax years against the future personal allowances. This is exactly what I do. I choose to take the cash around my birthday in January (earliest date I could do it on my 55th birthday last year) and have just taken £15,800 from one of my sipps, received a lower figure initially from the sipp provider, due to the 75% lump being taxable, and have, a few days later, received my tax refund from HMRC so now I now have the full £15,800 tax free. Now on it's way to a S&S isa. One more thing - if you become tax resident in Cyprus, you possibly need to liquidate all the ISA assets which you expect to need whilst living there before you leave the UK, in order to avoid Cypriot capital-gains tax. You should also consider whether you need to liquidate GIA assets to fully exploit you UK capital-gains allowance before leaving. As I understand it, you don't have to liquidate the ISA. You just can't add to it if you live outside the UK. 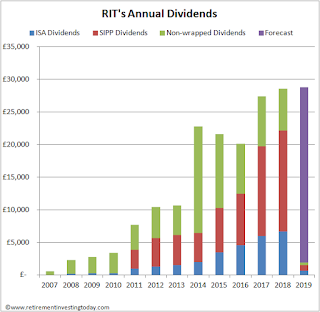 I'd be interested to hear what tax assumptions RIT has made with a move to Cyprus. From what I've read, there are minimal/no income and capital gains taxes for retired UK expats. There are even exemptions to defence contributions for 17 years. After that, taxes still look favourable. Though who knows what will change over that timeframe. 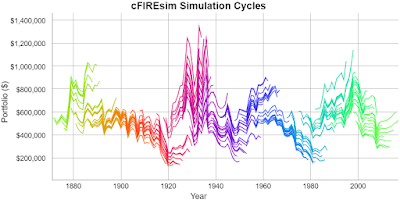 You've certainly thought through in some detail but I believe the model you are using is optimistic for reasons (1) As you've pointed out the cFiresim is based on US markets which have historically outperformed the rest of the world (2) Historical returns is not a good indicator in today's low interest rate environment. 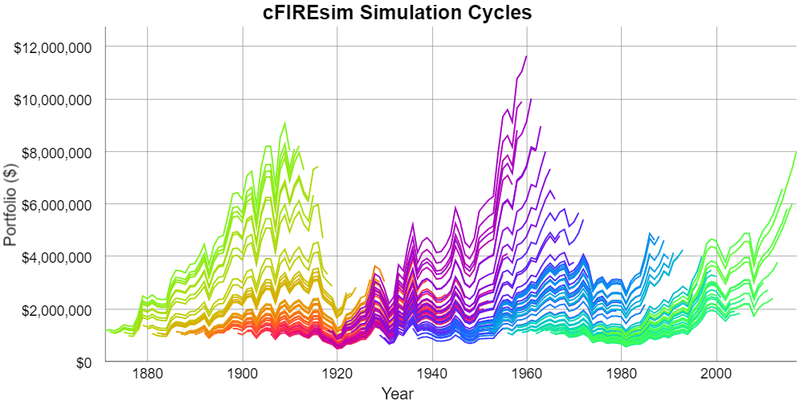 (3) The simulations assume a 50:50 split between bonds and equities. I wish you well but your numbers would be too tight for me. "(1) US markets which have historically outperformed the rest of the world" - the last table I saw showed the US outperforming everyone but Australia and South Africa. So the US was indeed the best of the big ones. What the relevant period was I can't remember. "(2) Historical returns are not a good indicator in today's low interest rate environment." We can't be certain of that, but I agree that your caution is wise. 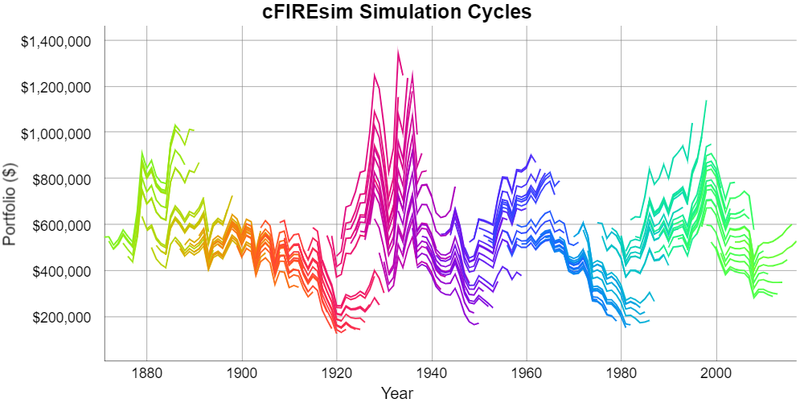 "(3) The simulations assume a 50:50 split between bonds and equities." What should someone do who thinks both equities and bonds are substantially too expensive? Lots of cash and a bit of gold? What if a period of 1970s inflation comes along? Is there any practical defence against that except TIPS? On (3), honestly I don't know and anyone who says they do is deluded. I suspect the best one can hope for is to keep a very broad and balanced portfolio covering a mixture of growth & Income, Sectors and geographies plus a big chunk of cash (two years?) to ride the ripples. FWIW our portfolio is c. 30% in equities; 25% in bonds; 7% in property; 10% in peer to peer; 5% in alternative assets; 12% in cash deposits and 11% is accessible cash. The cash portion is probably too high but I sleep at nights. I'm also quite sceptical as to whether I will get any state pension. I'm only 42 so my chances are a lot worse. Plus living abroad I have to factor in currency risk on top of everything else. As with you, I consider it a cheap insurance policy. I am further down the line, retiring in late 2007 with an almost entirely Equity based portfolio... when we talk about sequence of returns .... I started with a portfolio throwing off a good level of dividends and based it on a 4% drawdown rate. Clearly the portfolio value fell alarmingly but I stayed the course and was able to to rejig the portfolio in 2009-2010 and made a lot of ground back. I must admit whilst we have various ‘pots’ I take the view that money is fungible and whether one lives off the proceeds of sales in the taxable account and dividends are retained in the tax sheltered account, it’s all the same in the long term. It might help to know how old you were when you retired in 2007 . As far as equities are concerned clearly growth stocks /funds are the place to have been over the last 10/12 years . That situation may be shifting now more towards value stocks which will tend to yield more than growth stocks. Hopefully a 2.5% withdrawal rate will still see overrall portfolio value growth as you will not be drawing all the income your portfolio is earning. The long existing advice about splitting your portfolio ( equity : bond ratio ) based on your age has already been superceeded. An investors security is determined by so many factors that clearly those with various pots of wealth available to draw from are not needing to fine tune their withdrawal rate that precisely. Attitude to risk , peace of mind , age , state of health , family and families financial dependence on you are all potentially significant factors. Conclusion: As RIT says - do your own research. Wow - this is some serious analysis. Being almost 20 years younger than you, how long did it take you to pickup the 'know-how' to carry out this kind of analysis?